The freeway was completed through Coeur d'Alene when the Veterans Memorial Centennial Bridge opened to the east: The westbound lanes of the new bypass opened in July 1992; the eastbound lanes in August 1992.1 This stretch of freeway replaced an older section of I-90 along the immediate shoreline of Lake Coeur d'Alene between Sherman Street and Blue Creek Bay. That segment of roadway is now Coeur d'Alene Lake Drive, a two-lane access road and hiking/biking trail. The Potlach Hill Road overpass above the drive is a remnant from the original Interstate 90 alignment. Through Wallace, a small city at Exits 61 and 62, Interstate 90 was completed on September 12, 1991 when a 4,400 foot viaduct bypassing town opened to traffic. 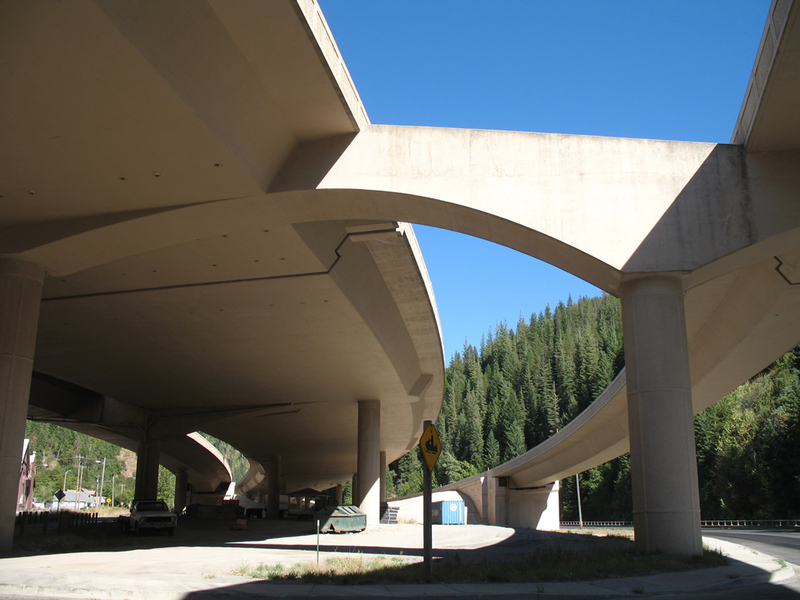 The 1970-plan for Interstate 90 took the freeway through the city street grid, but without the filing of an environmental impact statement.3 That and efforts from city officials added the entire town to the National Historic Register in 1976,4 leading to the revised plan for an Interstate 90 bypass along the hillside above the South Fork Coeur d'Alene River. Ramps to Business Loop I-90 and Idaho 4 descend from the Interstate 90 viaduct as it passes above Buena Vista Heights in Wallace. Photo taken September 1, 2006. Completion of the 30 foot high viaduct above Wallace led to the removal of the last traffic light along the nearly transcontinental journey of I-90, which was celebrated with a three-day event, including a horse-drawn hearse and a mock burial for the signal.5 A set of traffic lights still hang at the intersection of 7th and Bank Streets in Wallace, but are only operated in flashing mode. The signal used in the celebratory funeral in 1991 was a one-piece four-way signal used previously. It now resides within a coffin at the Wallace Mining Museum. Pleasant View Road south at the westbound Interstate 90 ramp to Spokane, Washington. This was the first exit in Idaho from the west until the November 2012 opening of the exchange with Point Parkway and Beck Road. Photo taken 09/01/06. Mullan Trail Road west at the eastbound entrance ramp for Interstate 90 at the Hill Top Interchange. Photo taken 09/01/06. Eastbound Mullan Trail Road at the Interstate 90 on-ramp to Missoula, Montana. This stretch of I-90 was built on a new alignment, bypassing an older stretch along former U.S. 10 from Silver Beach to Blue Creek Bay. Photo taken 09/01/06. Interstate 90 turns west from Mullan Trail Road to encircle Potlatch Hill to the city of Coeur d&apos;Alene. Photo taken 09/01/06. IDT places freeway entrance signs at on-ramps from surface roads. Unlike the assemblies in California, shields do not compliment the signs. Photo taken 09/01/06. "Freeway at 50 - Region's main transportation corridor has patchwork past, uncertain future." The Spokesman-Review, September 10, 2006. "Interstate 90 - Link Dedicated." Spokane Daily Chronicle, October 23, 1970. "Wallace road to be renamed Harry Magnuson Way." The Spokesman-Review, May 3, 2010. "It's Red Lights Out In Idaho Town." Chicago Tribune, September 15, 1991. "I-90 interchange now open in west Post Falls." The Spokesman-Review, November 23, 2012.